Update: This project has been superseded by the Neo Series Modular Polyphonic Pickups. Same technology in a modular form. The Neos are the culmination of the Six-pack project. After countless hours experimenting and iterating over the basic design, I think I’ve reached a point where I have something that I am actually finally satisfied with. Here now, let me present version 1.0 of the Six Pack Hexaphonic Pickup. The design is modular. Visible in the xray view below, the Hexaphonic Pickup actually contains three smaller dual active pickups sitting on a main board which contains no more than biasing electronics and a micro-miniature header connector. 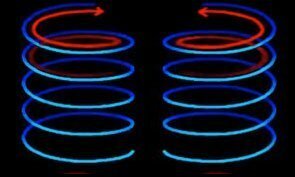 Six low impedance coils (2000 turns, 450Ω D.C. Impedance, flat frequency response, 20Hz-20kHz). High performance, ultra low noise OPA209 (OPA2209, dual) differential Op Amps. 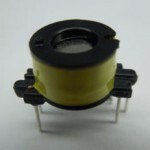 Single supply (4.5V to 36V). Stainless steel height adjustment screws and springs. 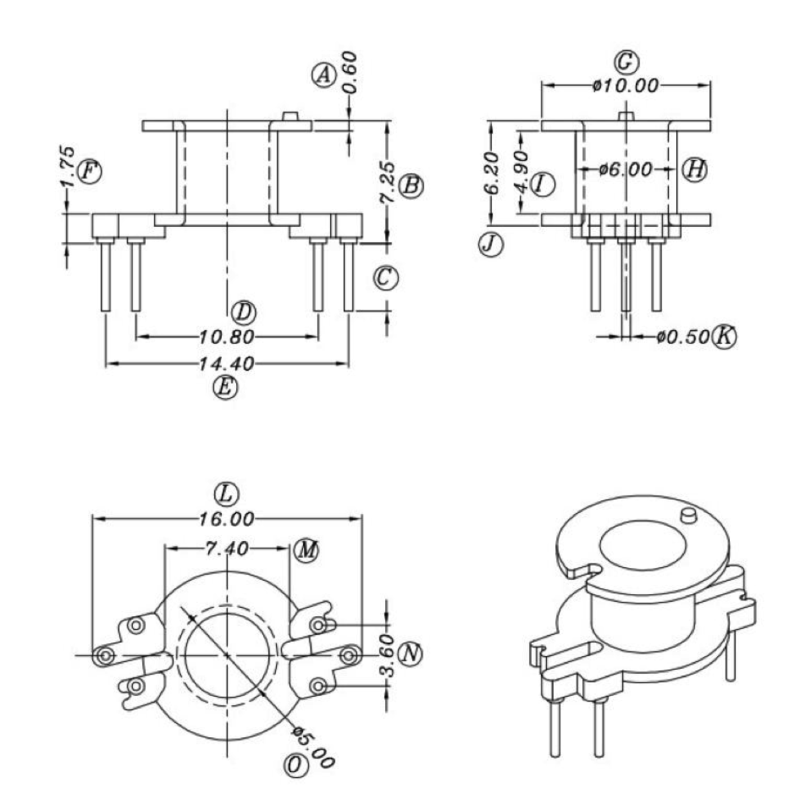 Gold plated, 1 mm pitch micro-miniature positive lock connector (Hirose). 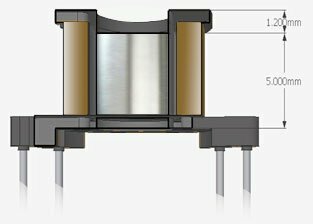 Premium 0.1% thin film low noise matched resistors. Fender Stratocaster Profile (11.8 mm height excluding connector). Each pickup has its own differential amplifier with a gain of 5 yielding a signal level somewhere between the output levels of a Fender Stratocaster and a Gibson Les Paul. Designed for professional audio preamplifiers, the precision Op Amp OPA209 (OPA2209, dual) is chosen for its superb performance (low noise: 2.2 nV/√Hz, 6.4V/μS slew rate, 18MHz GBP, 0.000025 THD, quiescent supply current of only 2.2mA (typical). See Op Amp Shootout for more information). 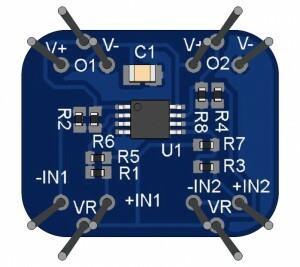 The Op Amp can operate from 4.5V to 36V, with rail-to-rail output swing capability. The amplifiers operate on a single supply with a reference voltage (VR) at ½ Vcc set by the voltage divider R5 and R6. 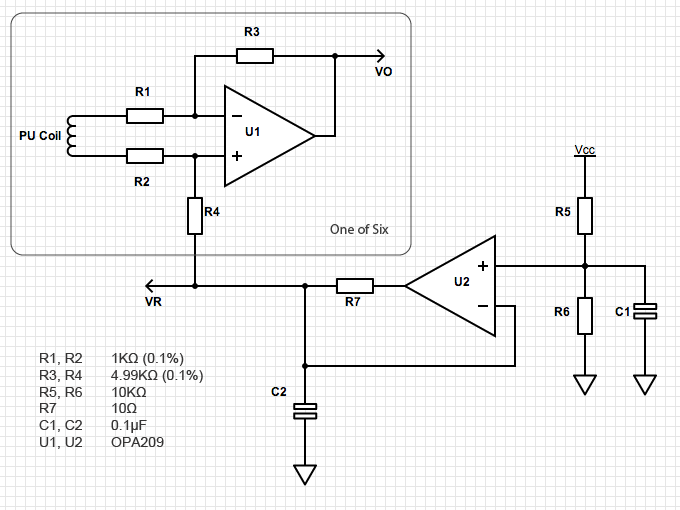 The unity gain buffer U2 provides sufficient current to drive other amplifiers. The 10Ω resistor on the output of U2 is there to prevent high frequency oscillations. All six outputs are configured as pseudo-differential with VR as the common reference point. Multi-channel pseudo-differential outputs provide common-mode voltage rejection by having a common reference point that is not directly tied to a common ground (the outputs are floating). 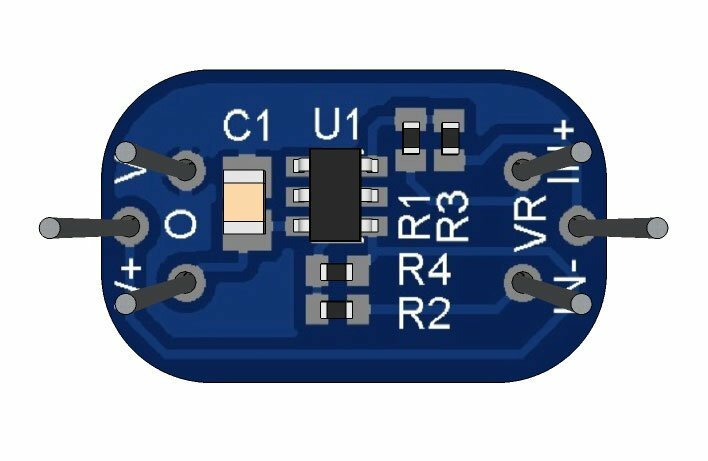 There is no need for D.C. blocking capacitors since each output is obtained from the differential amplifier’s output VO with respect to VR. 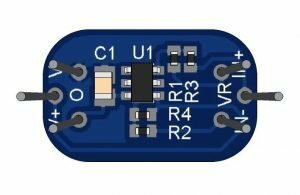 OPA209 is a good choice for our target application which is USB powered, but may be too much for other applications that require battery power. At 2.2mA per Op Amp, the total current consumption is thus 17.5mA. Fully charged 2400 mAh batteries will last 109 hours according to this online mAh Battery Life Calculator —not really bad in this day and age of smart phones with a single charge measured in days, but to some may still be excessive. For that matter, for those who still prefer ultra low-power consumption, a version using the OPA376 will be offered. AT 760μA per Op Amp, fully charged 2400 mAh batteries will last 316 hours. Go practice 8 hours a day and a single charge will last 40 days. While the tradeoff is low-power vs. low-noise, the OPA376, with a noise figure of 7.5 nV/√Hz is still a viable contender. Imagine being able to place active pickups just about anywhere!.. An interesting offshoot of the project is the Neo. These are very small, Neodymium active pickups (probably the smallest active pickups in the world) that can be used individually or in groups. 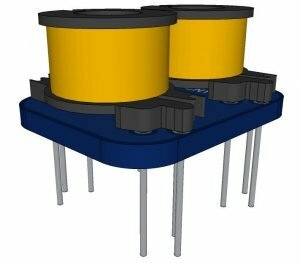 These are hacker friendly, general purpose pickups that can be used in a variety of applications. There are two versions. Neo-1 contains a single coil with a single differential preamp. Neo-2 contains two coils and dual differential preamps. Magnetic north facing up, clockwise winding. Magnetic south facing up, counterclockwise winding. Neo-2 contains both variants. This is your typical passive humbucker configuration and the net result is further common mode rejection of noise when the signals of both pickups (variant A and B) are summed. This shouldn’t really be necessary since the differential preamps already actively cancel out most of the common mode noise, but eliminating as much noise as we can wouldn’t hurt. Furthermore, the alternating magnetic fields make adjacent magnets attract each other, instead of repel. Those are just examples for the electric guitar. Neo can also be utilized for other musical instruments such as the bass guitar, harps, pianos, xylophones, etc. The pickup coil started life as an inductor. 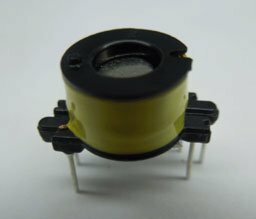 The coils are actually customized inductors from Chipsen, an electronics manufacturer in China specializing on transformers, coils and inductors. The inductor’s ferrite core is replaced by a 5mm × 5mm Neodymium magnet before potting. The magnet is recessed 1.20 millimeters from the top of the bobbin to decrease the powerful magnetic pull (Neodymium magnets are very strong!). Judging from our experiments, this also somehow enhances the magnetic focus of the pickup giving it a tighter bass response. 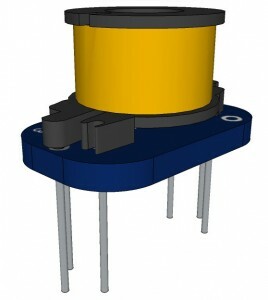 The complete assembly (bobbin, coil and magnet) is vacuum potted with epoxy to eliminate microphonic feedback. Epoxy is preferred over the usual paraffin wax because the pickup will have to undergo a high temperature soldering procedure that would easily melt wax. This is very interesting, and I understood also a modular solution. Is this solution useable for bass players, 4,5 or 6 string basses. 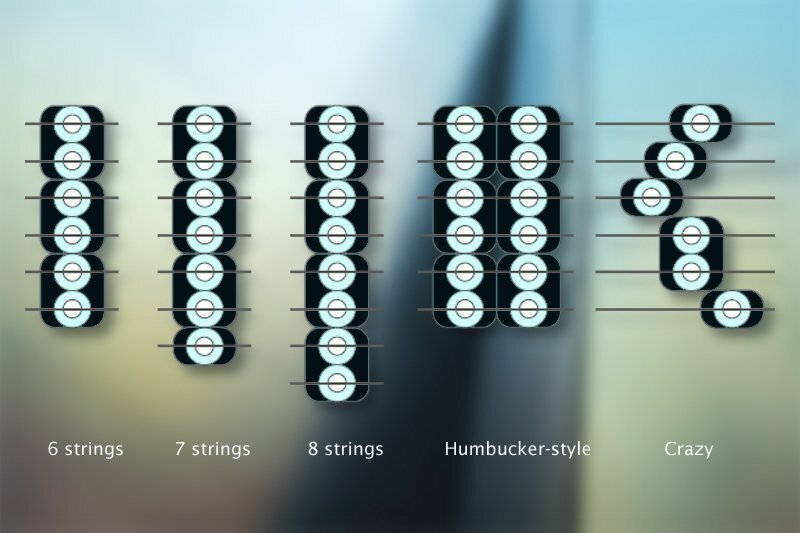 The distance of the strings differs (wider) and frequency spectrum differs. It's definitely suitable for bass too. Since the frequency response is full range from subsonic to ultrasonic, it is general purpose. You can use a state variable filter, if you want to mimic a certain pickup with some desired frequency curve. I'll see if I can do some experiments on the bass too. I'll try to post some sound samples (hopefully) soon. 1) The coils can be purchased regular retail, correct? 2) Vr is connected to the "ground" on the guitar cable, correct? Thank you, Ray. Yes, we intend to supply all parts. Coil only, bobbin only. PCB only, Neo-1, Neo-2, and of course, Six-Pack. Yes, you can connect VR to ground, but better yet, it can also be connected to a differential end-point where VO is the + and VR is the – inputs. Direct to differential input of a mixer would be a good idea (just keep in mind that the signal is hot).